Romantic Spring Nail Art & BornPrettyStore nail product review! It is about time I made a beauty related confession: I've been a lot into nail art recently. And by that, I don't just mean the subtle and wearable versions of a french manicure, I'm talking about the intricate, extravagant and a tad kitschy designs that are better known as "japanese nail art" too! Now, clearly, as much as I'd like to have molded flowers and pearls adorn my nails, that look can be a little overwhelming on an everyday basis, when errands and uni call for something that's practical and low-profile, not to mention I wouldn't know where to start if I were to give those elaborate looks a try; so, better to start off with something more basic. 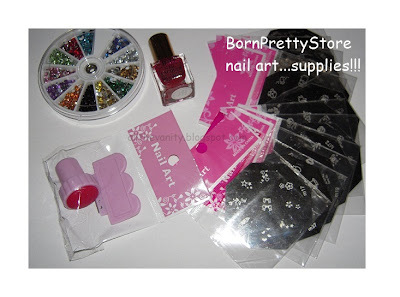 The majority of products I used for this look were provided by BornPrettyStore, an online shop which offers a huge variety of nail related items, from nail polish and stickers, to dotting pens and various molds for acrylic decorations - worth to check out if only for the huge variety. The 131 stamping set (one of their two options) includes 12 stamping plates, along with a stamper and scraper, which are identical to the Konad ones. In fact, the plates themselves are very Konad-esque, the only difference being that these ended up with a few more scratches by the scraper than the actual Konads. Apart from that, the process and performance was the same as with the Konad products - I used the same rolling motion to pick up the stamp from the plate and apply it on my nail as per usual. I have a very slight suspicion though that these plates are a tiny bit more prone to smudging that the Konad ones, however, I haven't stamped in a while and I may have gotten a little rusty. That said, if you use fluent motions, you shouldn't have a problem whatsoever (fyi, I used the m12 plate for the flower stamps). The round rhinestones (item 881) come in a wheel packaging that includes 12 colours, I didn't count them one by one, but I estimate there's about a 100 of each shade. On the website these are described as 2mm in diameter, whereas in reality, they're 3mm, something which should be corrected, since those could be too big of you're planning on making shapes with them. They are nice though, and if you're careful when placing them on, you should get many days of wear with them (in my case, the nail polish would chip long before these fell off). 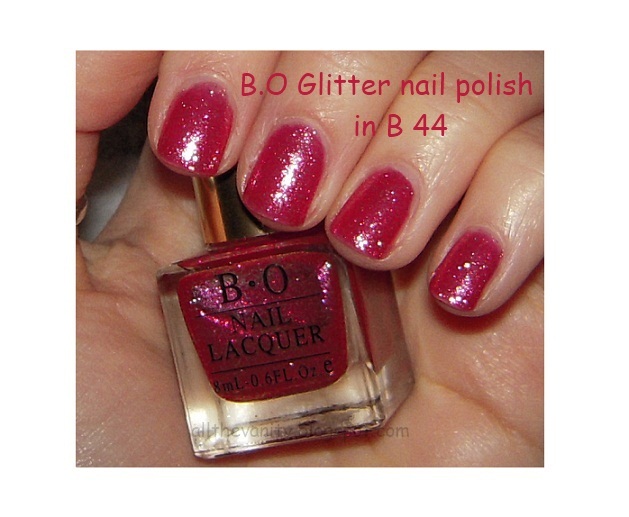 Finally, the B.O B#44 glitter nail polish is a warm raspberry pink base (again the website is misleading, since it describes this a shiny red), shot with silvery shimmer particles. If you're expecting sth like the OPI glitters, this is nothing like it, in that the glitter isn't chunky and the polish actually lasts a long time on the nail. The application was smooth, however it required 3 coats for a full coverage. 3 coats isn't really a big deal to me, however, this nail polish had quite a strong glue-like scent to it and needed more time to dry than usual. 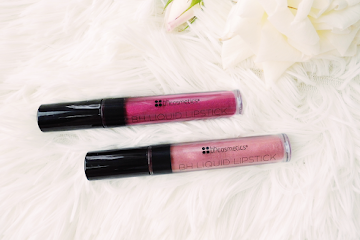 So, would I recommend these products? The stamping sets, absolutely, you get 12 plates with a huge variety of stamps to play with, and for their price ($11.49), you can't go wrong. The rhinestones are good and affordable too, they are, however, larger than promised. As for the nail polish, I wouldn't bother. You can get far better glitters out there I'm sure. And $3.51 for 8ml is really not that cheap in my opinion. Are you into nail art and what do you think of my first attempt? What other alternatives to the Konad plates have you discovered? I love your nails in the 1st set of photos! I've been looking for the right glittery polish and really want to get my mitts on the Deborah Lippman range! I love chunky glitter bits, so not sure if B.O would do it for me! p.s it was really insane meting Patricia Field and Anna Vissi! 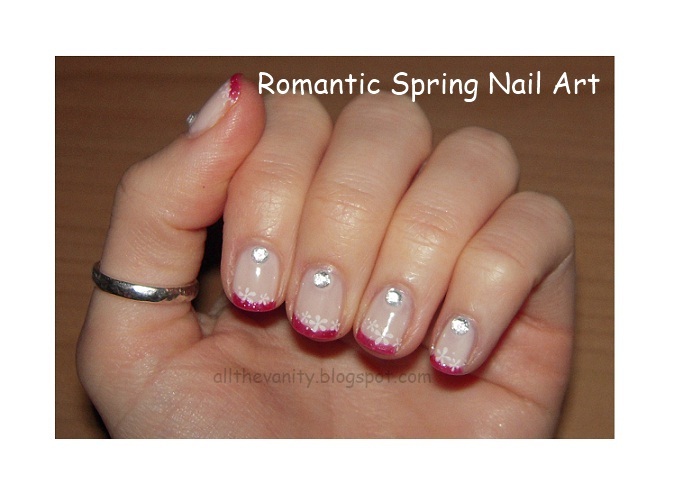 your nails in the top picture are soo cute- very Spring and I love it! Πρωτη φορα δοκιμαζεις να κανεις σχεδιακια κλπ?? Φοβερο το πρωτο σχεδιακι κ το κοκκινο ειναι επισης πολυ ομορφο..
amazing nail job luv! !wish i had you here!!! Was that your first attempt at nail art? You did a terrific job! I haven't picked up my konad set in a good two months or so - that's because I've been addicted to my fake nails with the french manicure airbrushed on and whenever I have them off I just let my nails go bare to recuperate. But once I got into konad it just added oil to the fire when it comes to manicures...I've even started looking at some nail blogs! @Karen: I know, the Konad ones aren't expensive, but if you're thinking of getting 5 or 10 plates, it quickly adds up! This was my second attempt at "nail art" and I plan on posting the first one sometime in the future too (and that was more elaborate, believe it or not)! And yes, it's SO easy to catch the...nail virus, especially after seeing different blogs etc! You may want to check out the nail art group on flickr, those designs are siiiick! I'm totally into nail art! Like, off the wall, Japanese pearls & diamonds nail art..the kind that makes people a tad uncomfortable. hehe. So this, I love--you did a great job! @fantastic: Hehe, I know what you mean, I can browse through pages of that type of extravagant nail art for hours on end!!! Too bad it would be a little OTT for everyday life (but then again, if I don't give it a go now, when will I? )!